A Beary Merry Christmas Mini Theme is a one day Preschool theme centered around a bear theme of course. Take pictures of the children and their teddies during the day to put pictures in album to share with parents. Ask each child to bring in a stuffed teddy for this day dressed if possible for a Christmas party. Wrap little books for gifts for under the tree for each child’s bear to open. Teddy’s join in the fun activities and special Christmas snacks. It is a lot of fun and emphasizes on the sharing aspect with others. Size up the bears by having the children line up their teddy bears from shortest to tallest. Put some jazzy music on and encourage the children to make their bear dance the way the music makes them want to dance. When the music stops, yell, “FREEZE! !” When everybody has frozen, start the music again and encourage them to dance. Give teddy a ride (jump?) on a parachute. If you do not have a parachute, a sheet works well. The children hide their eyes and count while their bears are hidden. Then everyone finds his/her bear. 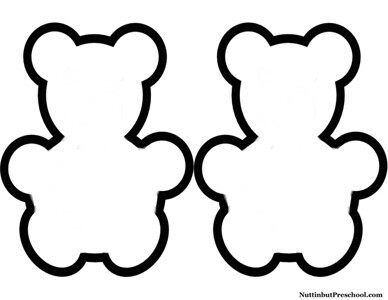 Precut bear shape from green or red poster board. Make hole punches all around and allow the children to sew in and out of the holes with red or green ribbon. Glue a pocket on the front of their bear and add a message in the pocket. “One big bear hug. Just for you. Merry Christmas! Love _______”. Add a ribbon or string for hanging as well. Cut out the bear shape from sandpaper. Rub cinnamon sticks on bears cut from sandpaper. Punch a hole in the bear and wear for a necklace. Use any type boxes you have saved to have the children make and decorate a float for their bear to be pulled in a teddy bear parade. Attach yarn or cord to their boxes for the children to pull their teddies float. Play music and have the children put on a parade for the teachers. Make sandwiches (bologna and cheese, peanut butter and jelly) cut into triangles and lemonade. Add in fruit, chips, cookies, etc. Tape bear paw prints to follow to the indoor picnic. 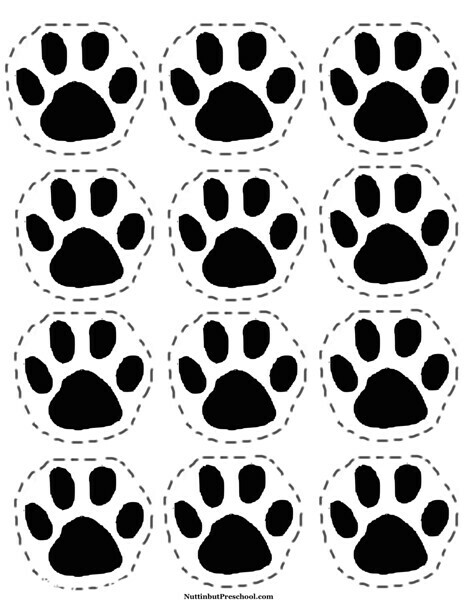 Tape bear paw prints on the floor to lead the children to a picnic. Bring in large paper towels that has teddy bears on them for placemats. Spread several small tablecloths on the floor and set up places with the teddy “placemats”. The kids chose their food from the picnic table and sit on the floor around the tablecloths. Treat your children to a snack of gummy bears. Use Teddy Bear Counters for weighing with a balance scale, to sort, and count. Weigh and measure each child’s teddy bear through the center time. Use a baby scale to weigh them and a clothing tape measure to measure the length of each bear. Cut adding machine tape the same length as each child’s bear and have the child decorate it with stickers and markers. 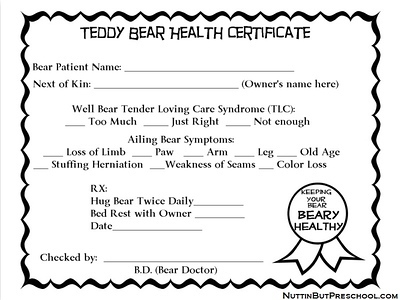 Put both the teddy bear’s and child’s name on them and post them in the room so the children can compare their bear’s heights.